I received a message this evening as I was watching my nieces and nephews. A friend of mine was having a rough time and needed help, but was unlikely to reach out to me though I’ve told her she could. I decided to give it a try once I got home this evening. At first I heard nothing from her, as I only have her info on social media. It’s done! It’s Done! Phew! Almost in time, the green and brown is the inside, the blues are the outside…I decided to keep the embroidery simple. We went to high school together and have only somewhat kept in contact over the years, but some days, the best thing that can happen is that you have someone to listen to when you need them. I think I helped her, though I could do nothing for her financially or to change her situation, she went to bed feeling better and like she could do what needs to be done tomorrow. Sometimes, that’s more important than what actually happens tomorrow, as it is a new day. So, after my tough week of training 4 hours a day and working longer than usual shifts on training days–oh, if they would have done this unpaid training two weeks ago when we were all getting sent home early….but they didn’t. My practical test didn’t go as well as I expected and I felt deflated. However, I’d made my nephew a promise of guitar lessons, and learned my goodwill guitar was useful as wall art only. It was turning out to be a downright disappointing day. But there were good parts that happened too. I ran behind in errands, so I offered to take my nieces to my dad’s to drop off the super-secret father’s day gift I finally finished. I forgot it on Tuesday when I was supposed to drop it off and left it on the couch in my backpack which has been my constant companion this week, except for Tuesday, when it sat on my couch with my training notes as well. My dear James and I bought my dad a six pack of various ales with entertaining names and presented them to him Tuesday afternoon, since we had arrived with coffee for ourselves. My dad does not drink coffee, but I simply could not go in empty-handed. 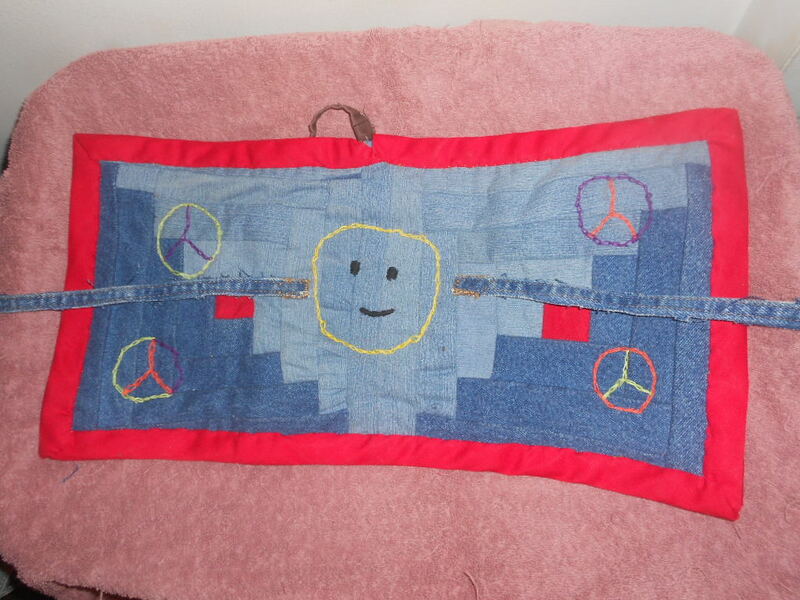 But I finished the bookwrap quilt, and tonight, I remembered my backpack and my guitar and the father’s day gift. I still forgot the camera. I felt accomplished for finally finishing this gift, and for remembering it. 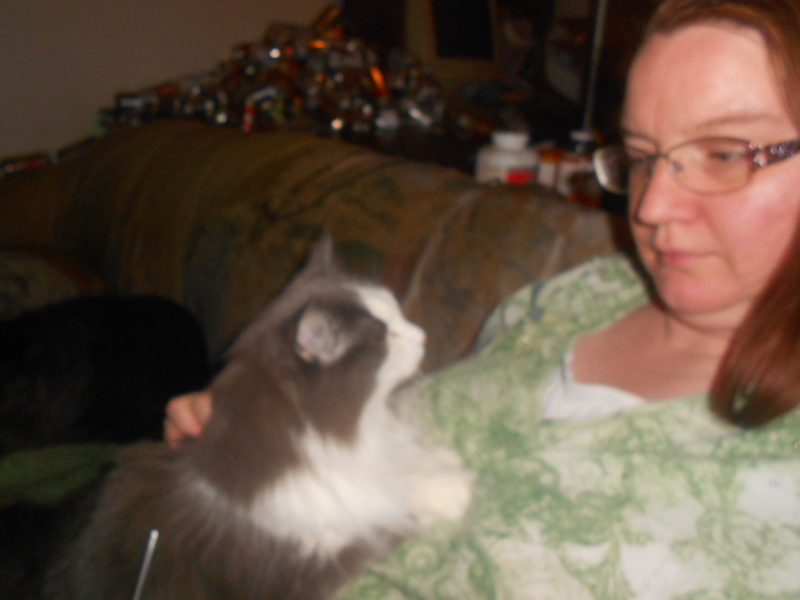 Later that night, after returning the munchkins home, I came home to open the airways to chat with a friend. Her situation made mine look downright simple. I didn’t ask permission to to discuss her situation, but she’s fallen on hard times, that involve more than not doing well on a test because you have an extra half-hour to over-think a process since each person going through the process takes longer than expected. 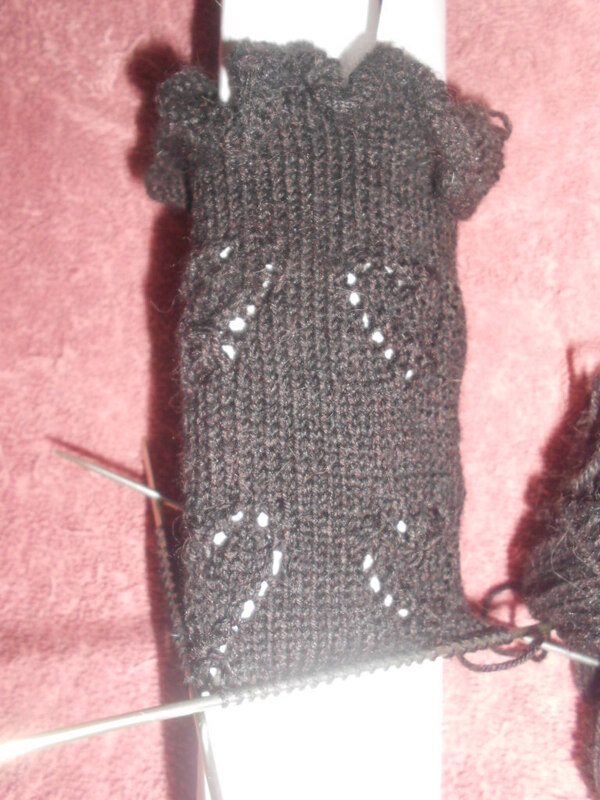 Tonight, after all that was done, and I chatted with my dear James, I picked up my knitting, in which I had knit half of the heel flap in black. While knitting the black section of the heel, due to focusing on the pattern and seeing the stitches, I instructed dear James not to talk to me while I worked through this eye of partridge stitch. Tonight, I switched to cream and noticed how much easier it is to see the stitches and to see how much easier it is to track stitches with contrast. While black yarn is difficult to knit with, I will have a beautiful sock that I should be able to wear to work when I’m finished. In addition, I’m told summer is cold in there, so I better start knitting faster. That may be easier with half the yarn in lighter contrast. Some days, you see only the top half of the sock, and see the dark difficult stitches in which someone included lacy holes to make little heart patterns. Other days, you get to see both yarns and know it wasn’t as difficult the entire way. While I still have to turn the heel at some point soon, I also know it will be easier knitting with the cream colored yarn. The dark, difficult part of this is not entirely behind me, but is getting easier to work with as we add more light.That’s part of the joy of the knitting journey each sock takes. I’ve gone and done it again. I didn’t get much knitting done again. I was going to knit. I thought I had extra time, but not this week. The excuses are real, and plentiful…I spent one evening spinning a marble in a planter and later in a pan trying to get the knack of spinning a roulette ball. A friend described the snap technique as a method of squeezing the ball until it has no choice but to leave your fingers. I went into training early the next day, and “got” it. It surprised me, but my extra time for training was spent checking my snap technique. 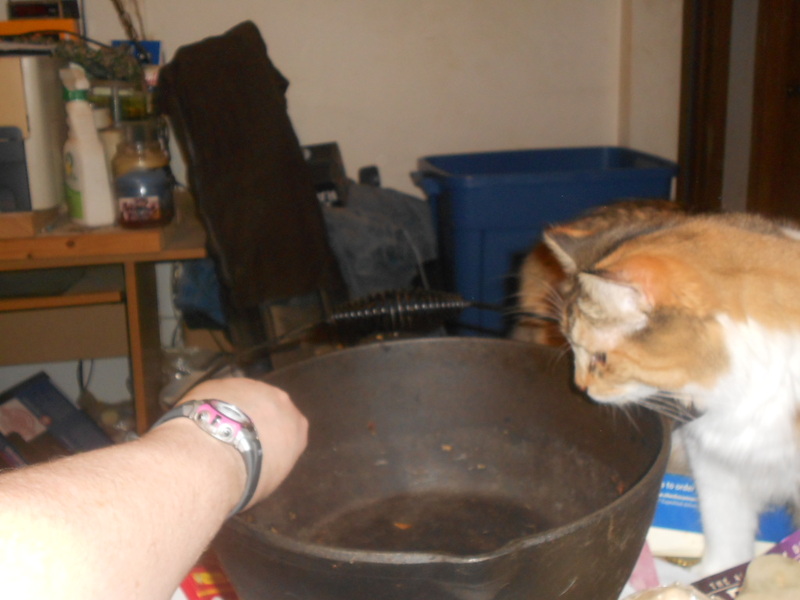 Scamp, watching the marble roll around the pan. In addition, I had to renew my license for my job. That was an extra trip before work as well, and fortunately, I got there on the day the lady chose to work that week. That stress is handled. Yeah, for me. I also borrowed my Little today, and took her yarn shopping at the local yarn store. I could not buy as it’s the day before payday. However, I searched out yarn for another gift for a person who claims she cannot wear wool. I think she’s never tried sock wool, and has tried one that wasn’t treated carefully. I started looking for a cotton blend. The proprietor recommended a cotton/wool/nylon blend to keep the elasticity. One lady at the yarn store said she tried knitting socks with bamboo, and they just didn’t hold up. I was grateful for their input before I committed to the purchase. I will return next week to purchase the skein I picked out and will take a photo of it, then demand my friend take photos of her project so I can chat about her progress here. For now, allow me to get back to the embroidery so I may trim and bind, and add the ties…oy and vey….this girl has a lot of work to do. 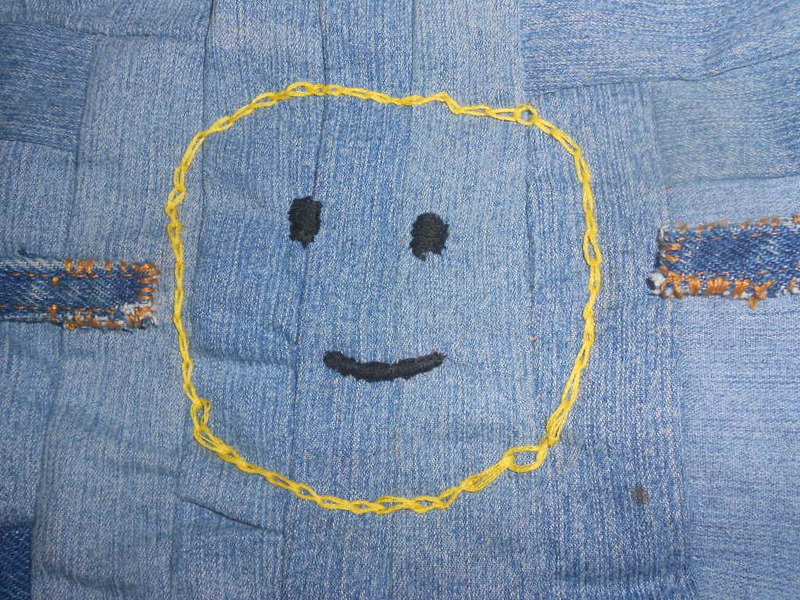 Now, the embroidery is done. 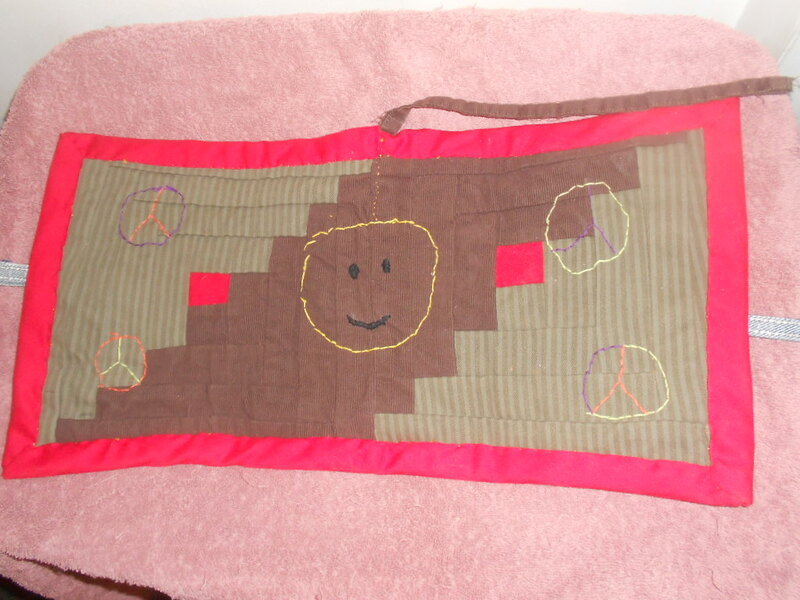 Then I must blind stitch the binding on both sides…then I’m done. Wait, no I’m not! Drat…I still have to sew on the outside ties after this…well, I’m still getting there. But I also have to wash it, and it’s for Father’s day, and it’s due Sunday. Perhaps we can get it washed before I wrap it and present it. Oy, vey…oh, dear. One thing at a time. In the meantime, a small report, about the cats that must help me with projects, who may or may not run off with embroidery skeins soon. 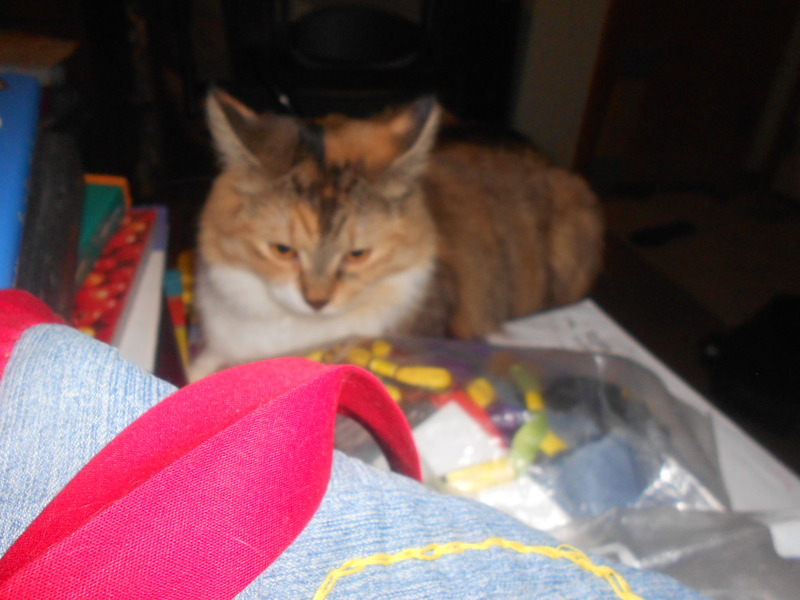 Putzer, guarding the knitting, or waiting for a massage. 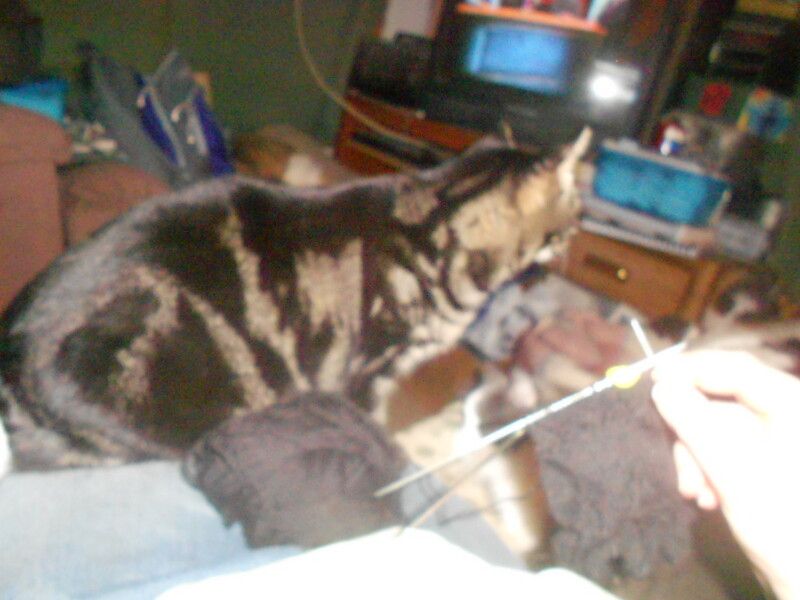 First, Putzer decided to guard my knitting, or he’s standing watch for his nightly massage. It seems we humans exist to massage Putzer…trust me on this. 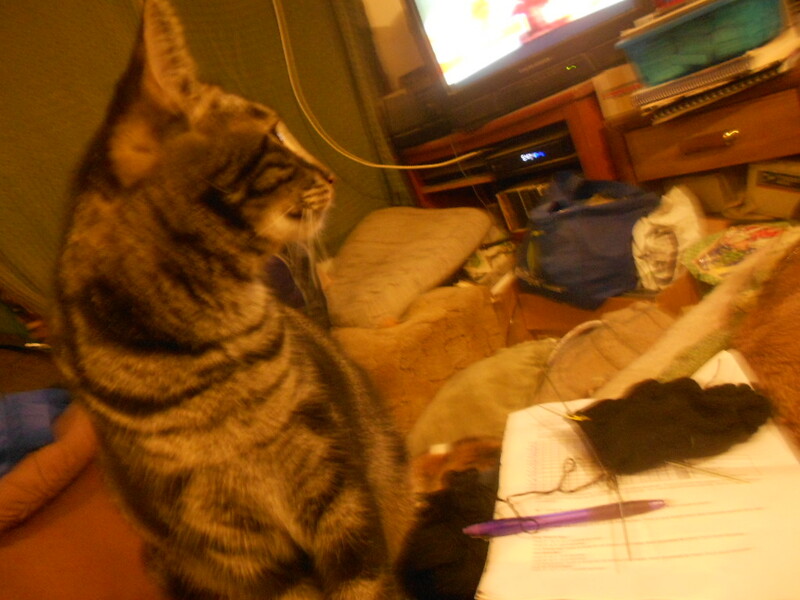 Scamp was next to determine that I was taking too much time embroidering the gift. She protested by sleeping on the handle of my scissors. 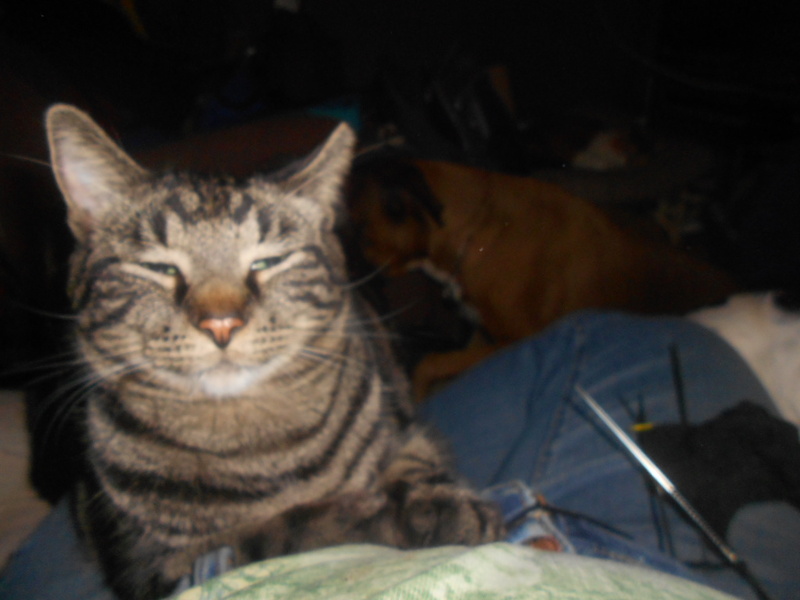 Later, it was simply my lap and in the way of the project. Pictures of the actual project will come, I promise. Then the dogs joined in. Briannag is great about stealing my spot and my pillow; and quite stubborn about giving it back. 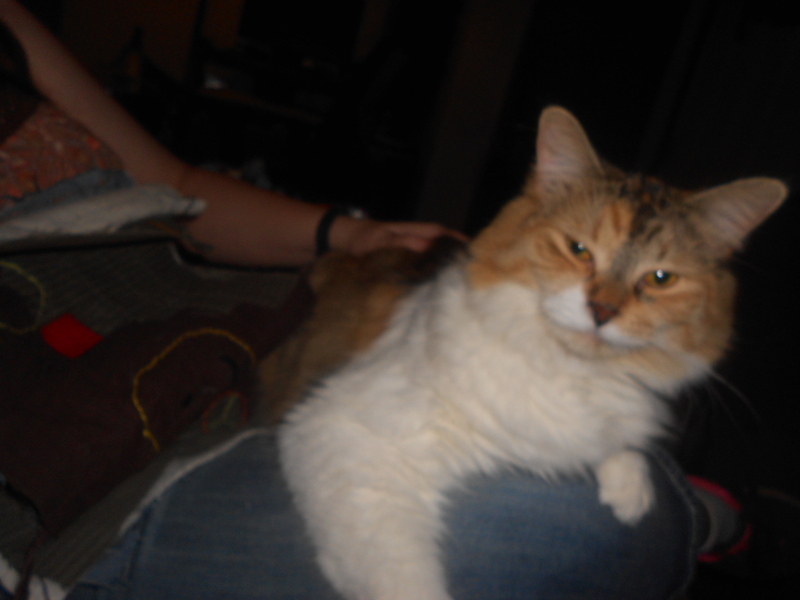 Zeus even took a turn at it tonight, once Briannag was scooted to her own section of the couch. Squib mostly left it alone. 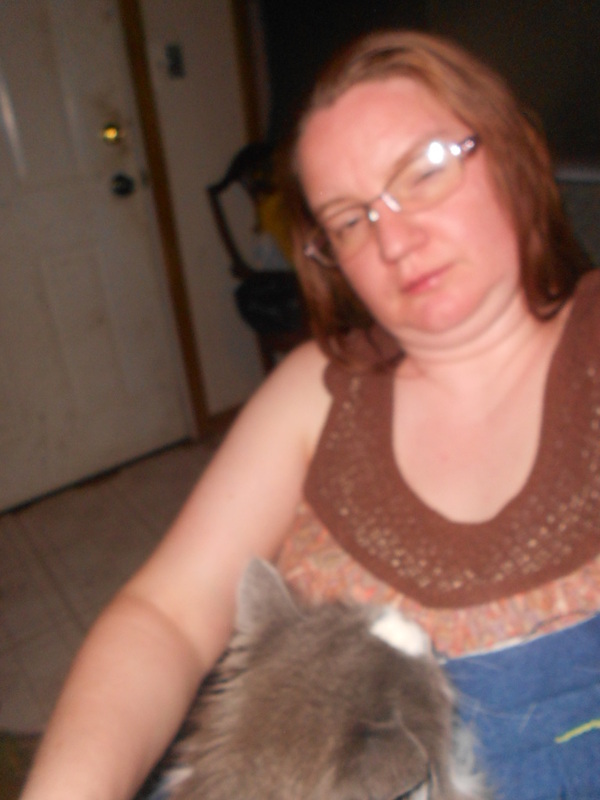 Maeve, however, decided that if I was in the computer chair, I was providing a lap for her, regardless of what else was occupying her lap. Zeus, taking his turn at taking my spot. Somehow, I still got all the symbols embroidered in, mostly reasonably. Now I must remember to clean up the embroidery floss and take photos of the finished project when it is done. 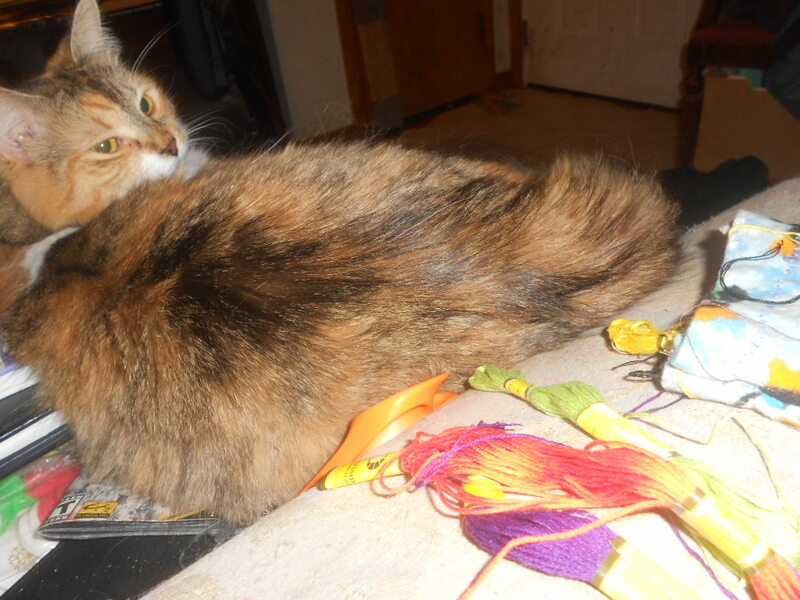 Some days, I consider trying to teach the pets how to sew or knit, but I’m not sure they’d not find their own projects once they got it. Until next week, when I have a heel to talk about. Most of us get in trouble for sleeping on the job, unless it’s written into the contract. With the kitties and puppies, it just may be. Yes, I get it, 80# dogs are not supposed to be called puppies, but they are always going to be puppies to us…trust me on this. So, tonight, I sat down to knit my lace repeat thinking about sharing upcoming birthday or father’s day gifts. I decided if I dish before I gift, then it’s the one time the recipients will load this up to check it out, and only one of the gifts is knitting related…I’ll save that for when I really need something else to talk about. Tonight, I sat down to knit, then realized the younger and more exuberant of the two was up to something he shouldn’t be in the kitchen. While working through the correction on that, and telling him that every surface of the kitchen was “MINE,” I had to shoo Briannag off of my knitting bag. 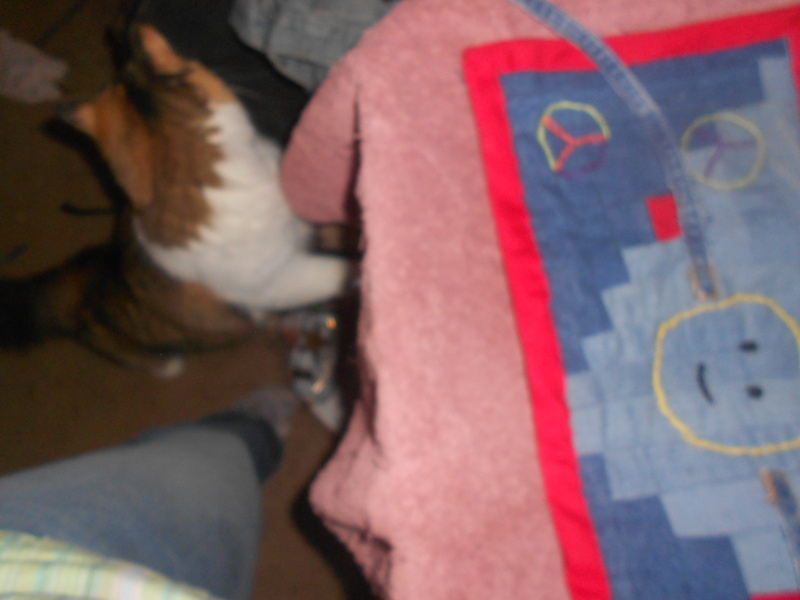 She was climbing upon the couch right where I’d left the knitting bag. Talk about distractive efforts, especially as Zeus decided he should run into the bedroom after each good, firm, command. I hope we’re making progress…I think he thought last nights homemade chili powder smelled good. 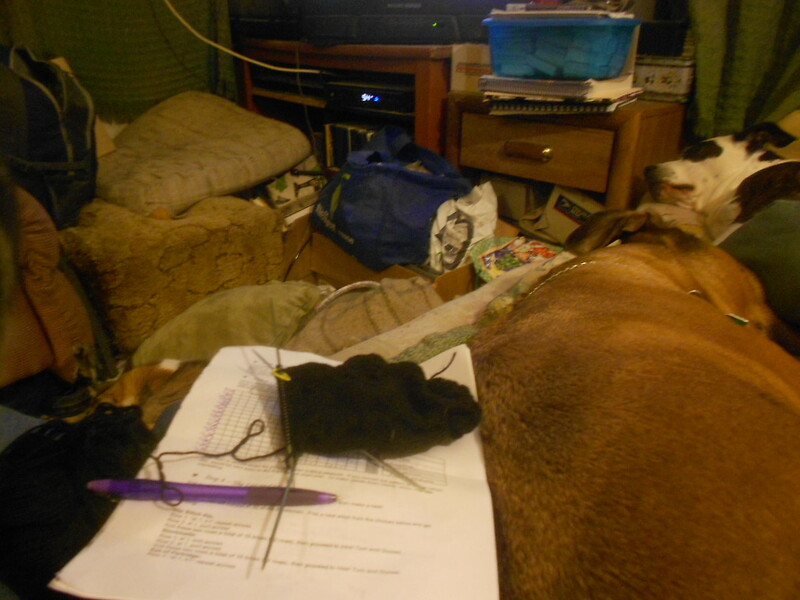 Once the dogs and I came to terms, I sat down to knit. I knit away on the lace chart as I have over the last two weeks, trying to keep things going according to the chart. 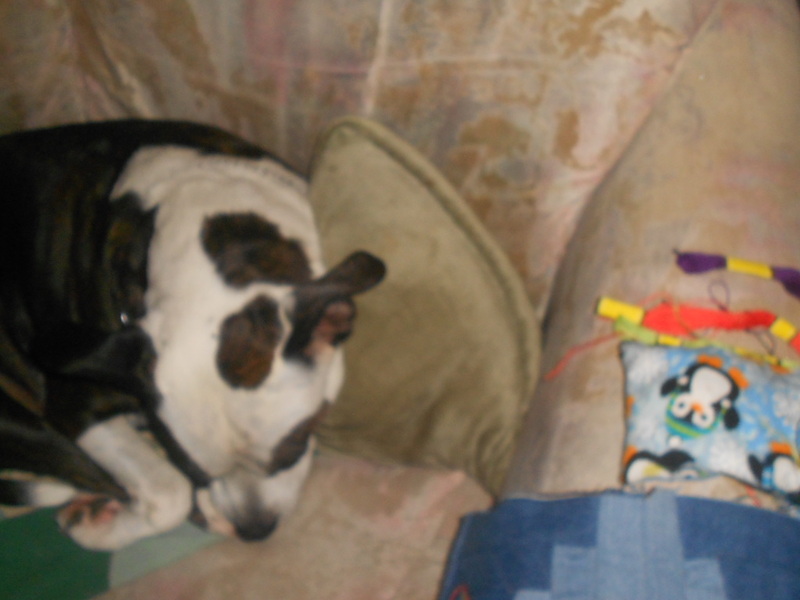 While I knit, I noticed Briannag asleep on the other corner of the couch. Squib decided to join us as well. 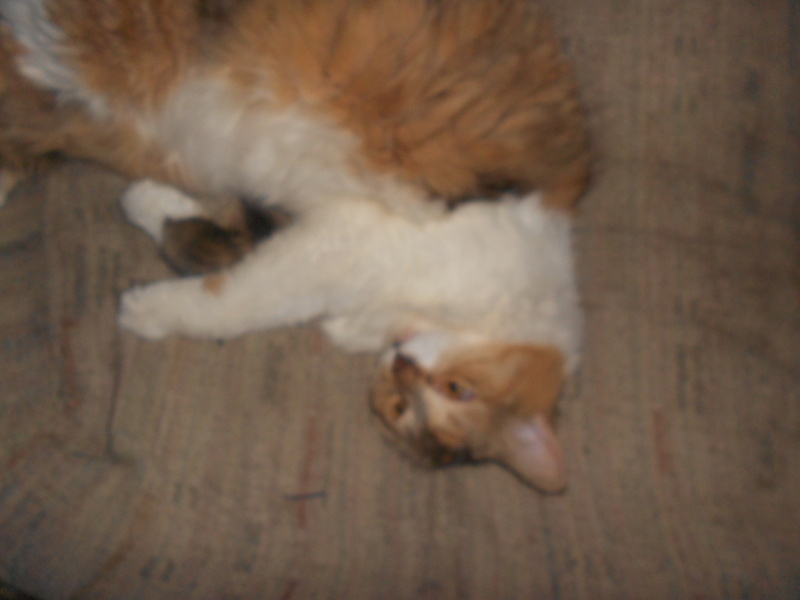 Maeve was next to me in her favorite spot on the couch. 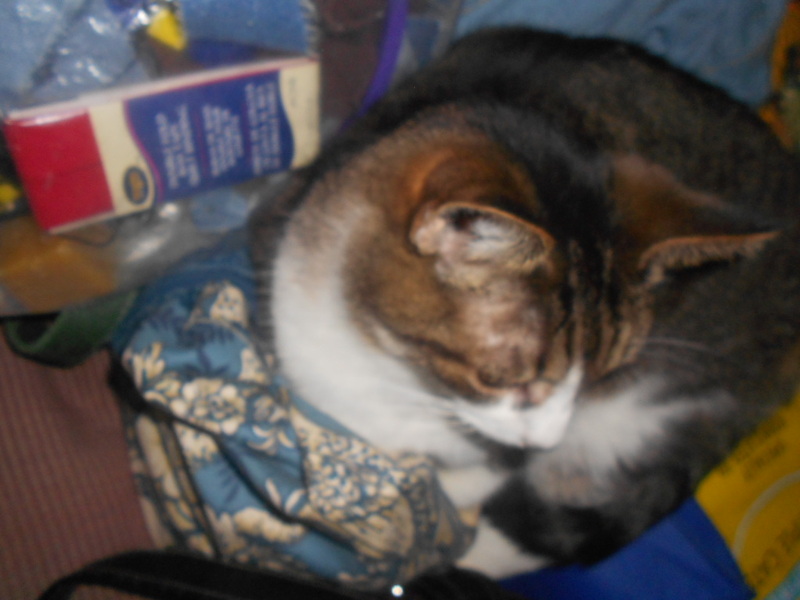 Later I realized she was curled up on top of the knitting bag. Leave it to my cats to find the oddest places to sleep. 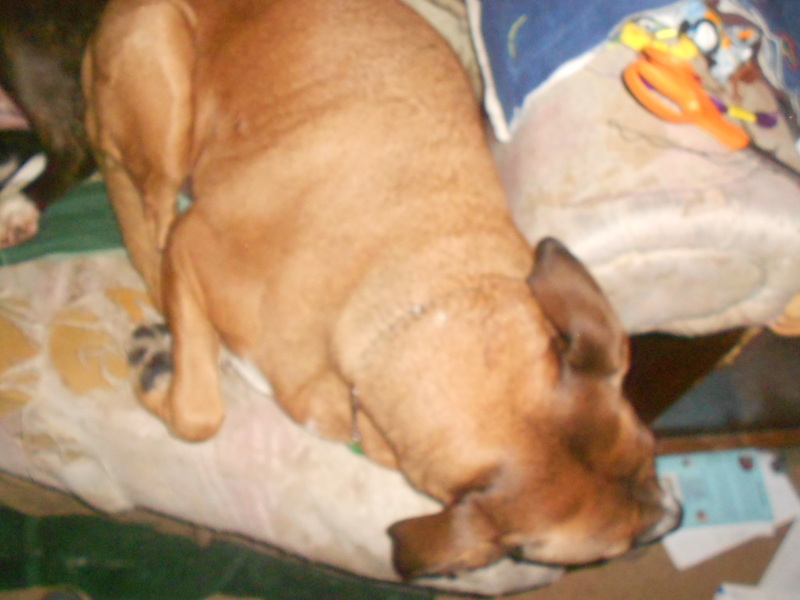 Putzer was curled in the chair on one of his favorite spots, and Scamp was off on the floor. After a bit, Zeus decided to check that Mom had indeed forgiven him and curled up next to her on the couch while stepping too close to Squib for comfort. Snuggling sounded really nice. Scamp woke up from her napping spot on the floor and sought mom out while giving her cooing meow to check that I was still here, I think. 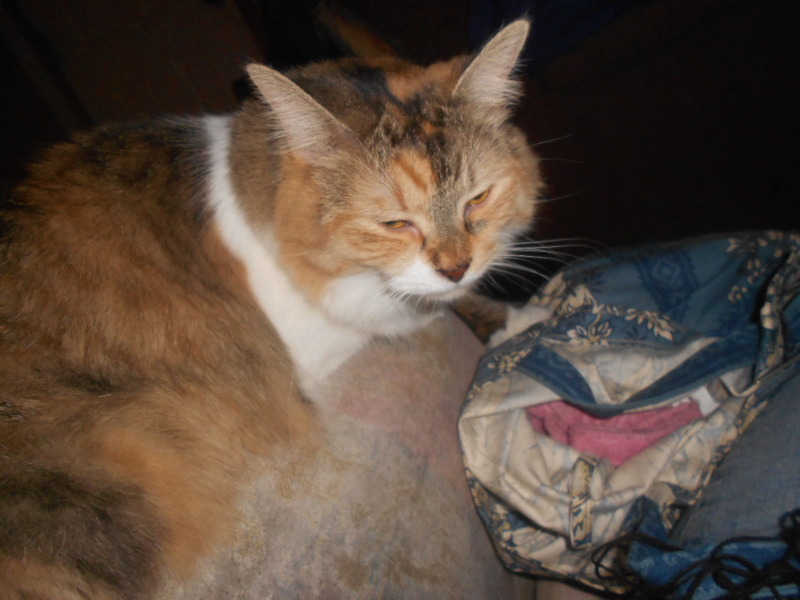 She’s the only cat I think I’ve had that coos and meows to tell you she is awake. Oh, wow, is this a knitting blog. There isn’t much to tell knitting wise, and I’m thankful for the kitties and puppies sleeping through most of it, as the photos will show you. 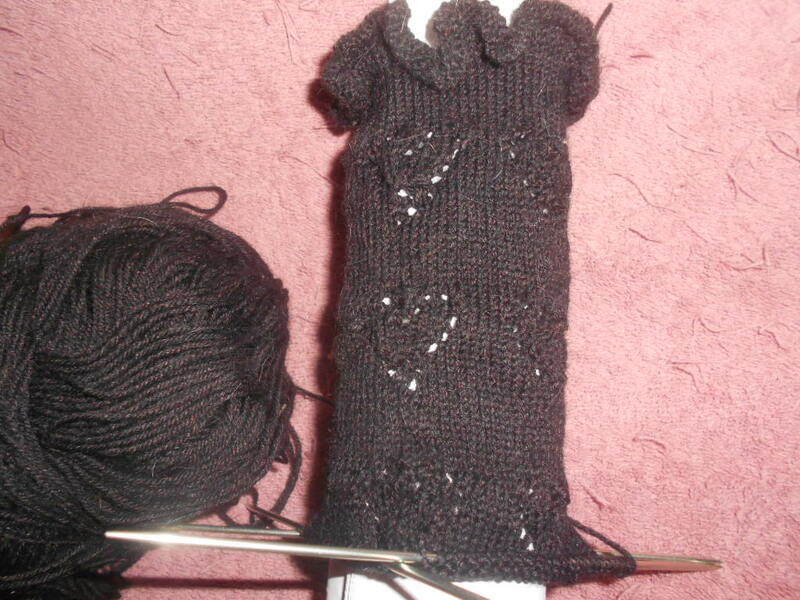 There is progress on the sock, which would have been much more challenging with more interruptions. So, for this week, I’ll simply leave you with a log of sleeping pets and show you the progress on the knitting. Enjoy. 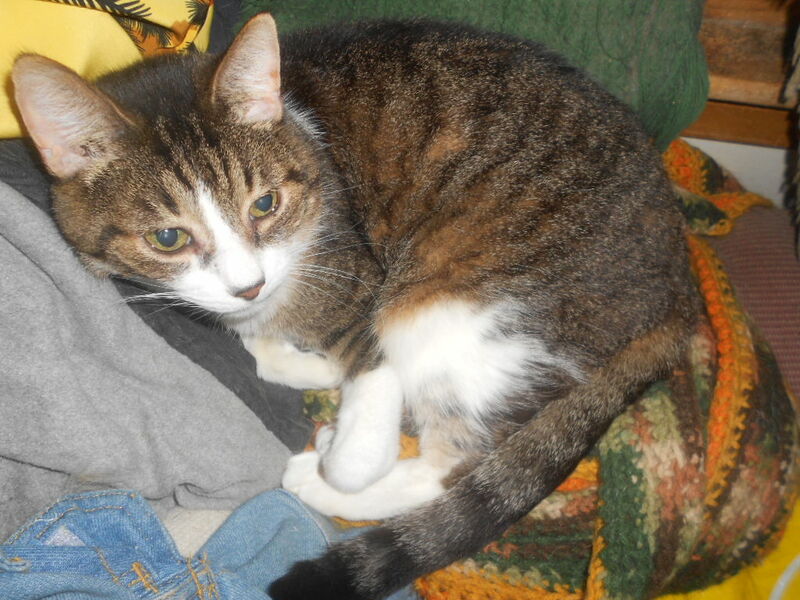 And, yes, that is cat hair likely found in my socks. I’ll never be able to claim my knits come from a pet free home. I get it, really, I do. “Life is messy, full of interruptions and complications,” states Karl in Love, Actually (2003) when Sarah apologizes for her brother interrupting their blooming relationship scene. You want to scream at her to make another effort throughout the rest of the movie. But Karl is right, and this week, I’m simply knitting socks…but they’re a small love affair of their own. 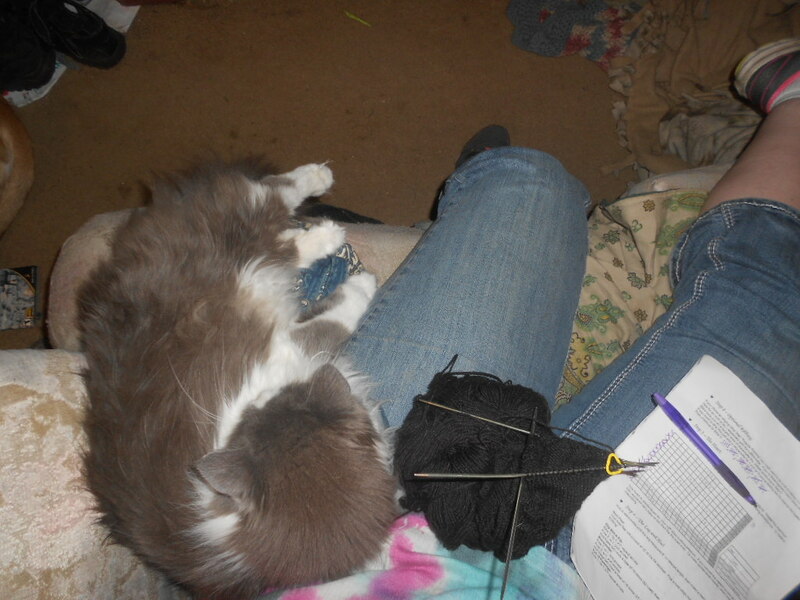 Squib, wanting to snuggle as I knit. I sat down Monday night, or Tuesday, whichever night I had enough energy to knit the inch of stockinette stitch that would lead me to the next section of hearts. 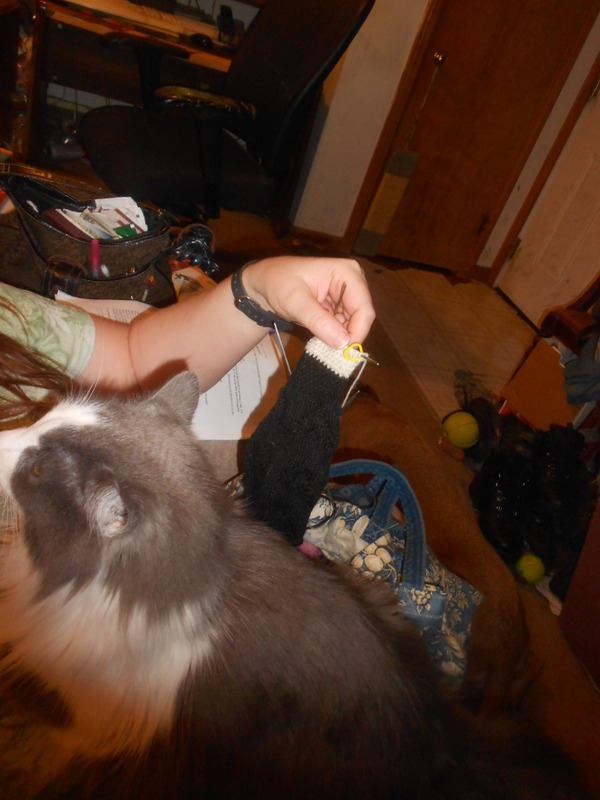 Shortly after I began, Squib decided to join me and offer some assistance with the knitting. I will never be able to claim these socks free of Squib hair. He just matches the skein of yarn too well. Fast forward to tonight, and I’m cooking and knitting. I’ve had a recipe I’ve been meaning to get finished much of the week, so I prepped it earlier tonight before I started knitting, and I placed the humble breakfast casserole in the fridge to rest before I cooked it. We were out of half and half, so I used greek yogurt with milk. It worked, thankfully. As I preheated the oven, I began the lace knitting chart. 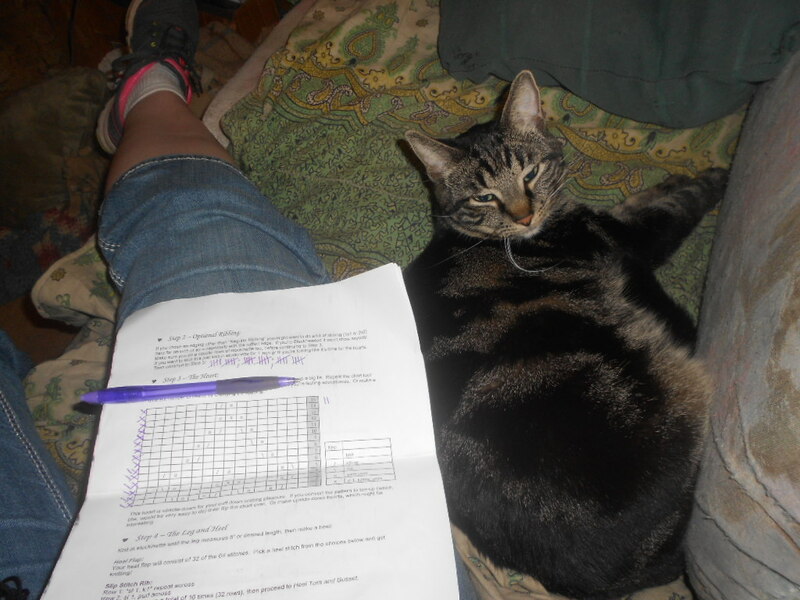 In the first row, Squib came to say “Hello, love me.” During the third row, Maeve decided to test my ability to memorize the row of knitting I was working on. 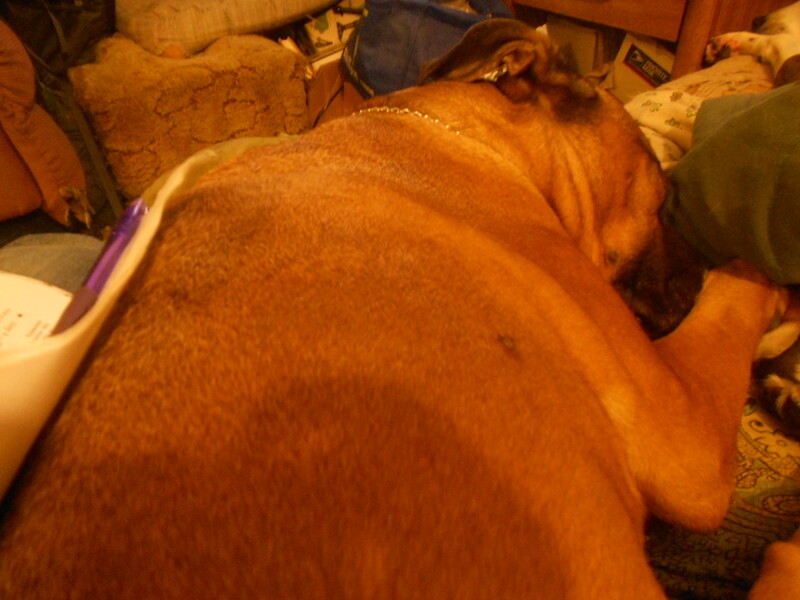 Briannag decided to test my pattern for drool-proofness(waterproofing) as she snoozed on my leg. 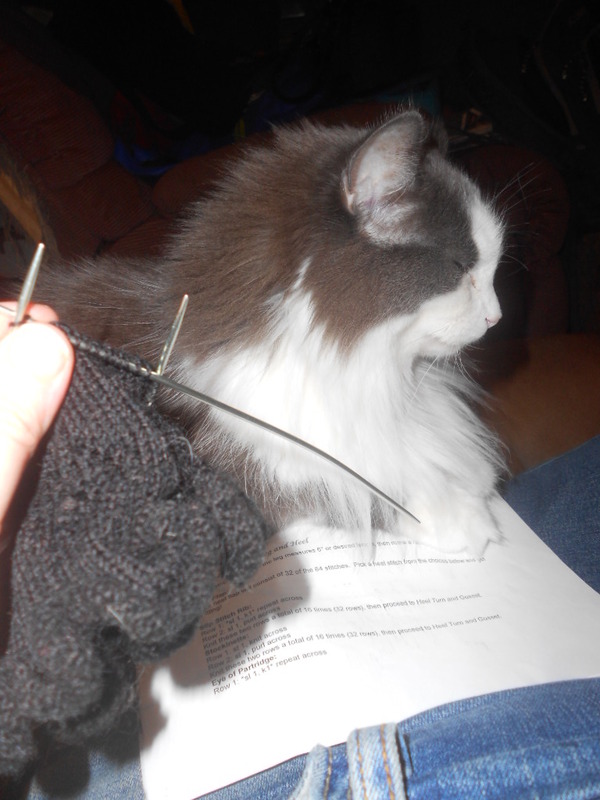 At this rate, its lucky I get any knitting done. Then the familiar beep of my chat window happened, and my dear James was online during a break from work. I reported the kitties and puppies activities while attempting to knit the third row(a pattern row) and told him some about dinner. Once I finished row three, I set the knitting aside to finish with fewer interruptions. Dear James went back to work. 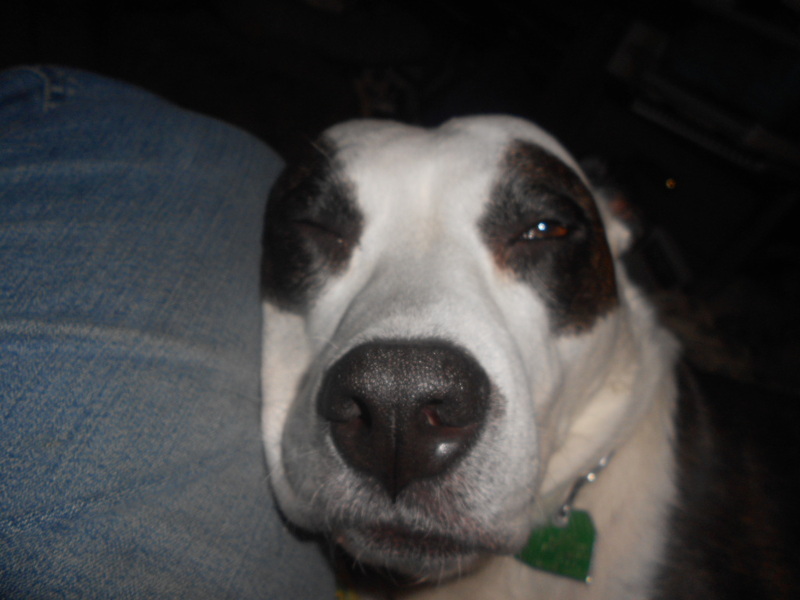 I scooted the dog from my spot (Briannag truly thinks it is her spot), and poured a glass of wine. 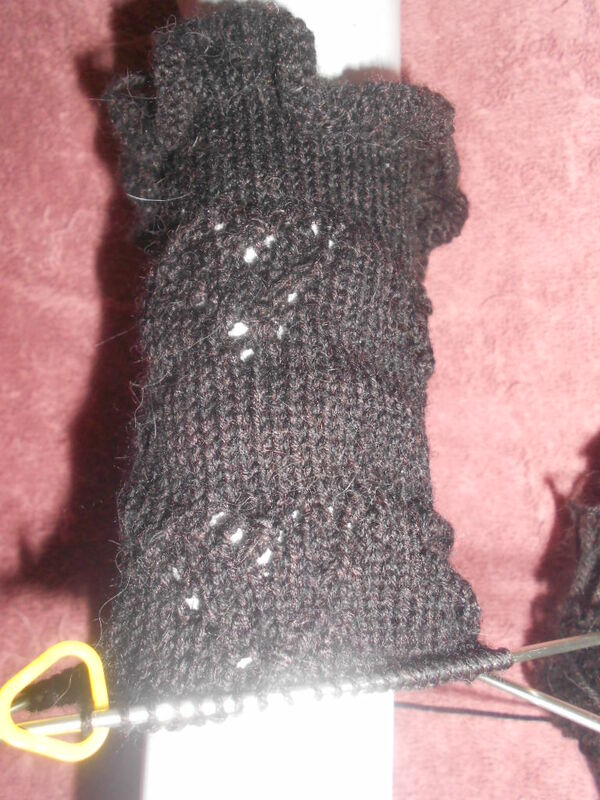 Then I knit the simple stockinette stitch for row four, and marked my spot. I finished the row with about a minute left before the breakfast casserole was finished cooking. I waited for it and checked the egg setting. It looked done, but it’s hard to be certain the egg has set. I turned the oven off and returned the casserole to its warmth. It would help the egg be certainly set without overcooking it while I knit the next round. I was two-thirds of the way through row five when the timer went off five minutes later. I knit to the end, then pulled the casserole out once more. I knit a few more roles to let it cool, then at the end of row ten, decided I needed to eat as well. Its yummy. Its easier to pay attention with a full belly. 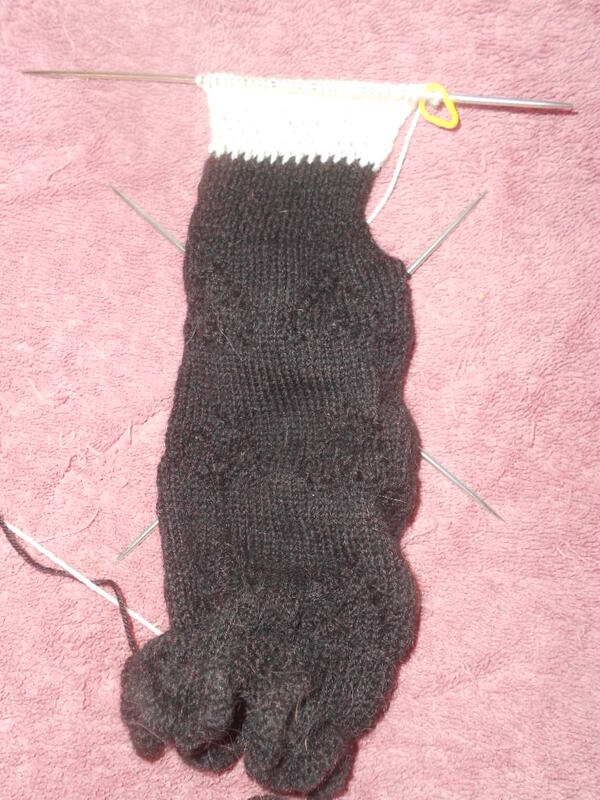 Current progress on the sock…one more lace heart repeat to go…then the heel. May next week bring even more before I begin training to learn to deal roulette.